Neo-Impressionist painters relied on the use of the surreal grounded in reality to create scenes of mystical, dreamlike beauty. Their use of vibrant colors helped them capture a certain mood and tone. The Phillips Collection wants to know what vibrant colors and textures you would use to decorate your dream home! 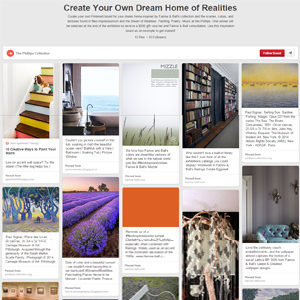 Enter our Dream Home of Realities Pinterest contest for a chance to win a grand prize that might make the walls of your dream home become a reality. A Farrow & Ball color consultation: a personal in-home color consultation with a trained Color Consultant from the new Farrow & Ball DC showroom in Friendship Heights. The Color Consultant will consider the light in the space, the shape of the room and architectural details, as well as the overall look you are trying to create before recommending a color scheme using Farrow & Ball paints and wallpapers. 1) Follow The Phillips Collection on Pinterest. 3) E-mail a link to your completed board to contests@phillipscollection.org with subject line “Dream Home of Realities Submission” to be officially entered into the contest. The winner will be selected and contacted by January 16, 2015. We’re excited to be #NeoImpressed by your creativity!